Mat has become rather fond of breakfast burritos. I tweeted about it the other day and was asked for the recipe… It’s not very impressive. I will say that he thinks my breakfast burritos are “bleeping phenomenal” so maybe you should eat one (I’ve never tried them because I’m trying this new thing where I don’t eat animals). If you’re looking for some fancy burrito secret, I don’t have one. He’s a picky eater and I often cook with pretty simple ingredients so don’t expect to be scouring the isles of Whole Foods to find something you’ve never heard of if you want to try to recreate Mat’s favorite breakfast burrito of this off season. Note: there are about a million ways to make this more healthy and/or diet friendly. Think center cut bacon, turkey bacon, reduced fat sausage, egg whites, taco sized tortillas, reduced portions, etc. This is the extra fat version. Eat at your own risk and maybe run the stairs or something if you’re into that sort of thing. Prep your cheese and onions. Cut your bacon into small strips, cook in skillet, set aside. Cook the sausage as you would cook ground beef, set aside with bacon. Melt about a tablespoon of butter or something like it, add onions to skillet, cook for about 1 minute, add eggs and a little salt & pepper, scramble. When the eggs are almost fully cooked, add bacon and sausage back to the skillet. Fold it into the eggs to get a nice mixture going on. When the eggs are cooked, remove pan from heat, sprinkle cheese on top. Heat your tortilla! You can do this however your little heart desires but when I’m making a burrito, I get both sides of the tortilla wet, stick it between paper towels and pop it in the microwave for 30 seconds. This keeps your tortilla from drying out and also makes it pliable and burrito friendly. It’s good to be burrito friendly. Trust me, I’m from California. Put your tortilla on a plate, put the stuff in, fold it, eat it, boom. Some like it hot but if you don’t, I hear using the regular Jimmy Dean sausage & cheddar cheese is pretty delicious also. p.s. turkey bacon is so rude. Your always so helpful in giving out life saving tips, such as, “The Spicy Don’t Eat This If You’re Watching Your Girlish Figure Breakfast Burrito.” lol. Thanks for the recipe though…I love trying new things! And if Mat says its good why not try it out?!? I’ll take a pass. Thanks. This from the woman who searches all over the town, up and down, looking for an omelete. 🙂 Just kidding! 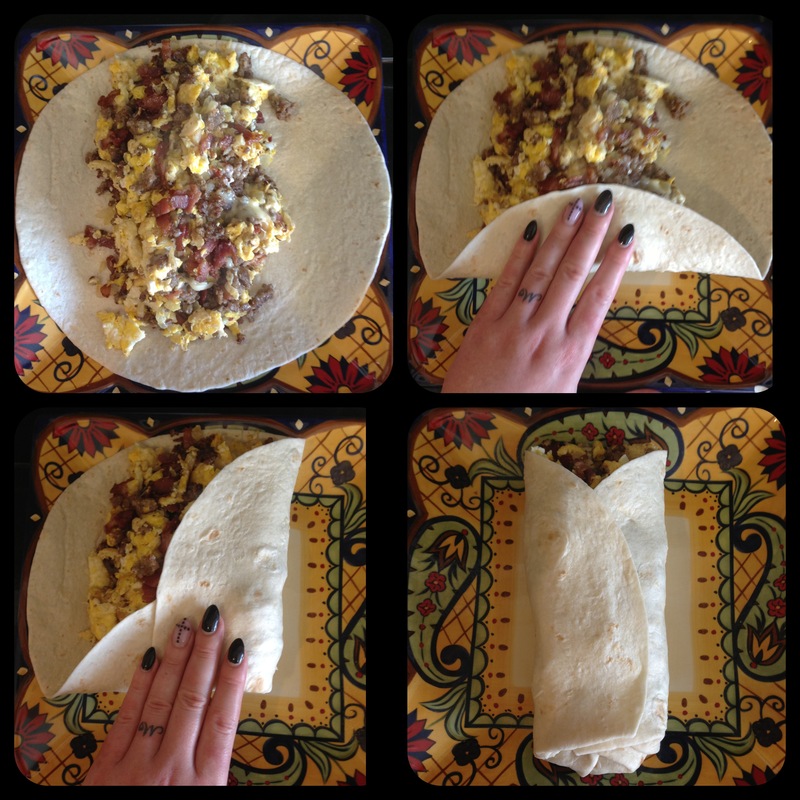 I love a breakfast burritos as well, and this sounds “bleeping phenomenal to me as well. Your burrito looks really good! May I ask what the tattoo on your ring finger is? BTW, your dishes are really cute!! taking in far more than they have to. Everyone knows that nowadays we have numerous fat burners although merely a small number of them can present you true benefits. the unrestricted duration for which they are played.